NEW YORK (CNS) — Honoring the sacrifices made by the men and women of America’s military is the major impetus behind the action movie “Lone Survivor” (Universal). In theory, paying tribute to troops is laudable. Yet it matters how one voices that appreciation. 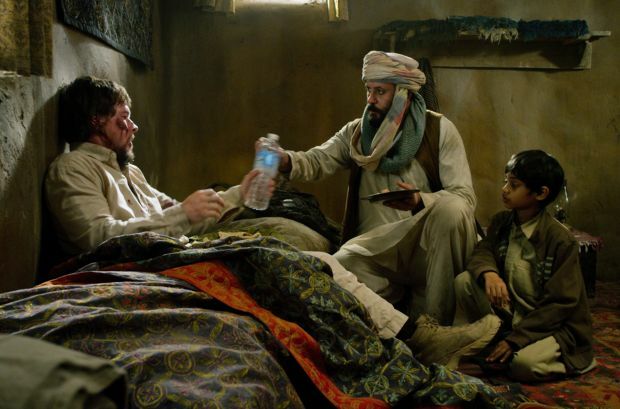 The film, which chronicles an ill-fated mission by Navy SEALs inside Afghanistan in 2005, does so bluntly and superficially. Adapted from a bestselling memoir by Petty Officer Marcus Luttrell, “Lone Survivor” manages to transcend politics and is squarely patriotic without being jingoistic. It doesn’t seek to assign blame within the U.S. military or to demonize the Afghans. But a less-than-flattering portrait of the fallen soldiers emerges because the movie’s effort to sanctify the warrior ethos of the SEALs clashes with a script riddled with expletives. Gruesome, bloody violence adds to the dissonance. There’s something to be said for memorializing soldiers without sanitizing their battlefield experiences. But the aim of commending them is undercut to such a degree that the cinematic equivalent of a polite “thank you for your service” would be preferable. After file footage of the rigorous training undergone by these elite operatives is shown, a severely wounded Luttrell, played by Mark Wahlberg, is seen being evacuated to a field hospital. 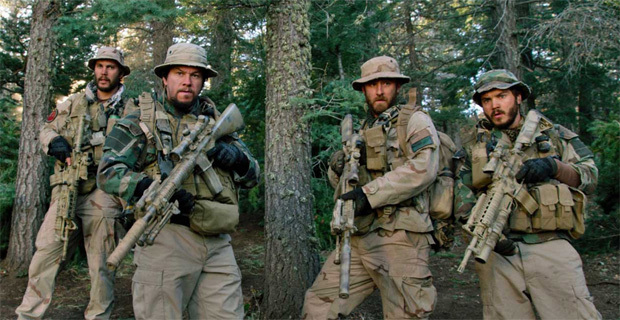 Then the movie cuts to three days earlier as SEAL Team 10 prepares to launch Operation Red Wings, whose objective is a notorious Taliban commander named Ahmad Shah (Yousuf Azami). Along with al-Qaida-linked terrorist activities, Shah is responsible for the recent deaths of 20 Marines. A fairly explicit sequence showing his men beheading a civilian informant confirms his villainous bona fides. In their quarters at Bagram Airfield, the SEALs engage in some mild hazing and jocular competition during the build-up to the mission, which commences with a four-man reconnaissance team being dropped into rugged, mountainous terrain in Northern Afghanistan. Led by Lt. Michael Murphy (Taylor Kitsch), the team consists of gunner’s mate Danny Dietz (Emile Hirsch), sonar technician Matt “Axe” Axelson (Ben Foster), and Luttrell. The plan is for the men to scout the village where Shah is located before calling in the balance of their unit. From the outset, they’re hampered by communications problems and the mission is irrevocably compromised when goat herders stumble upon the advance team. In the long, fierce battle that ensues, the outnumbered SEALs sustain catastrophic injuries. Then a rescue effort goes disastrously awry. All four fighters prove tenacious and one displays extraordinary heroism. Afghani villagers opposed to the Taliban also behave selflessly and courageously. Writer-director Peter Berg (“Friday Night Lights”) stages the action with intermittent aplomb. Those primed for a gritty war flick won’t be deterred by the visceral mayhem. But since the approach is about as subtle as a stun grenade, the viewer is put into a state of distress that squashes the suspense and tamps down sympathy and admiration. The expletives uttered by the SEALs don’t reflect well on their training, discipline or character — no matter how understandable they may be as expressions of fear, anger and futility. Their cursing seems like an unhelpful expenditure of precious energy and makes it difficult for the audience to focus on the warriors’ praiseworthy actions or to find a deeper connection to them. Arguing that the language is realistic and accords with Luttrell’s memory of the battle merely implies limited imaginations (and vocabularies) on the part of the filmmakers, who no doubt took artistic license in dealing with other aspects of the story. In the final analysis, the objectionable verbiage and gore permeating “Lone Survivor” indicate a lack of creative insight and finesse. Rather than diminish our gratitude for the sacrifices made by members of the Armed Services however, it should serve to remind us there are better ways to depict and memorialize them. The film contains frequent graphic war violence, including a beheading, numerous gory images of battle wounds, frequent profanity, pervasive rough and crude language and some sexual banter. The Catholic News Service classification is O — morally offensive. The Motion Picture Association of America rating is R — restricted. Under 17 requires accompanying parent or adult guardian.